The aim of expanding civic engagement has typically been promoted in top-down fashion. Ben Berger chides academics about this, and he advocates a more realistic view of citizens’ attention as well as more pragmatic strategies. 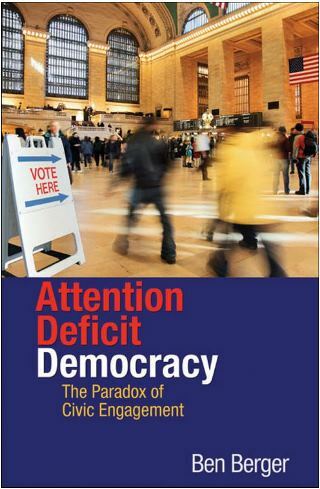 The requisite framework is to observe citizens’ tastes, to find ways to get them to pay attention to political issues; and, when attention is secured, to mobilize their energy. Within this framework, he proposes three general solutions. Berger’s favored solution is bottom-up: he proposes to somehow channel existing energies in local associations and municipalities into lobbying of state and national government on political issues. He visualizes a “federated” structure, where local resolutions bubble upwards in a larger structure. I will cut to the chase: in general, I do not think this approach will work in today’s society. This is not to say that we wouldn’t benefit from greater local engagement in the US. Increasing it certainly might not be easy. Parents, local businesses, and aggrieved groups have always had natural motivations for getting involved, but getting other citizens involved is typically like pulling teeth. For example, community-level discussions of educational issues may be dominated today by representatives of the teachers’ union and the chamber of commerce, lawyers, educational psychologists, and advocacy groups. …Meanwhile, in a crowded and splintered media environment, the techniques required to reach and persuade large numbers of fellow citizens are becoming increasingly sophisticated and expensive. Attending meetings may not be particularly important anymore. Instead, advocacy groups of all stripes develop short, simplified messages that test well with focus groups, and the advocates then try to disseminate these messages through the mass media or social media forums. …U.S. politics is largely manipulative. Politicians, interest groups, and pundits use sophisticated techniques to persuade a large audience to adopt views they have chosen. The second factor is the relentless migration of our lives into the online world. (Berger published his book in 2011, and, like all of us, did not yet fully appreciate how sweeping the societal changes would be as the news moved online, smartphones proliferated, etc.) An important effect is that most public dialogue is now online. And the third factor is the steady trend towards nationalization of our politics, well documented by Daniel Hopkins. In a campaign for state or local office these days, you’re as likely today to hear accusations that an opponent advanced Obamacare or supported Donald Trump as you are to hear about issues affecting the state or local community. In an attention economy, local issues are crowded out. And, unfortunately, the second and third factors are mutually-reinforcing. With politics having centralized and moved online, the national online discussion may be the most important venue now for political engagement. Of course, it is not pretty. The quality of news has degenerated; the public status of experts has diminished; citizens are increasingly polarized; civility has decreased; and social media creates filter bubbles. The second general solution proposed by Berger is to elicit more attention to politics by appealing to existing tastes. Examples that he cites include Rock the Vote (designed to appeal to young people through pop culture), The West Wing (TV-watching entertainment), and Rush Limbaugh’s talk radio show (radio entertainment). Berger notes that celebrities, who dominate the precious resource of public attention, may as a result become a larger part of politics; he cautions that it could have the effect of “cheapening” politics. The obvious, widespread, new taste today is websurfing and social media. We look at our devices incessantly. Millions watch YouTube videos, read online news, and share interesting content with one another online. Online conversations about politics on Facebook, Twitter, and other platforms are themselves an important form of political participation, watched closely by political organizations. Promoting political engagement among the upper middle class…— who already tend to participate at much higher rates than the rest of the population— is unlikely to improve democratic representation, fairness, or legitimacy commensurate with its cost. Berger rather quickly concludes that this tastes-modification approach generally won’t work too well on adults, but he is nevertheless enthusiastic about trying to shape the tastes of people when they are young, via various types of civics education. I would always support more civics education in schools, though I have always felt the long-term effects are oversold. Berger, for example, recommends involving students in a local policy problem and taking their proposals seriously, in the expectation that it will increase their desire for political engagement into adulthood. I cannot help but relate that, as a student council member in high school, we were tasked with a decision of whether to keep a door in the back of the school locked so that students wouldn’t sneak out there to smoke. I can say with confidence that the experience did not influence my interest in politics in adulthood, one way or the other. Meanwhile, the principal aim of civics education, presumably, is to make us good citizens. But good citizenship today for the overwhelming majority of citizens is mainly about voting intelligently. And voting intelligently depends mainly upon understanding the issues; it’s not so much about understanding constitutional government or even about how to be an activist. Unfortunately, kids typically do not have enough life experience to understand most current political issues (e.g. health care policy, economics, immigration) in any more than a superficial way; thus, learning about the issues generally needs to happen during adulthood. I would admit in general that trying to change adults’ interests is a priori a low-probability shot. An exception, though, is that greater engagement could result if there is a latent, unsatisfied interest that is subsequently satisfied with a new resource. In the online world, for example, new, pleasing kinds of material about political issues hypothetically could lure some currently-unengaged adult citizens into greater political engagement if it meets that latent interest. In summary, Berger’s three general solutions, as described, don’t exactly hit it out of the park, especially given the way that society has recently evolved. But what Berger is very right about is focusing on the “demand” side of politics rather than the supply side. Until we take very seriously what ordinary citizens do or do not want to do, political engagement will be unaffected, and democratic functioning will suffer for it.